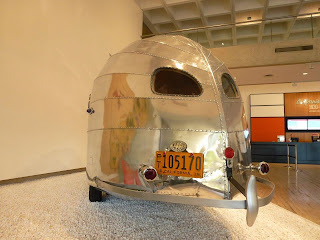 Having seen everything contemporary in the Melbourne Now mega art event, it was the design of California over the 1930-65 period that captivated our attention during a weekend arty visit to Brisbane. 'California Design 1930–1965. Living in a Modern Way" features some 250 objects that helped to define modern style in the 20th century, including furniture, textiles, fashion, graphic and industrial design, ceramics, jewellery, metalwork, architectural drawings and film, and is the first exhibition to examine California's role in shaping the design culture of the United States and the rest of the world. The Queensland Art Gallery on Southbank is the only place in Australia where this unique collection of innovative designs will be on show. It runs 'til February 5. The exhibition traces the origins of a distinct modernism in the 1930s, the design breakthroughs made as World War II technologies were adapted for peacetime use, and California's subsequent emergence as America's epicentre of innovation in architecture and furnishing. 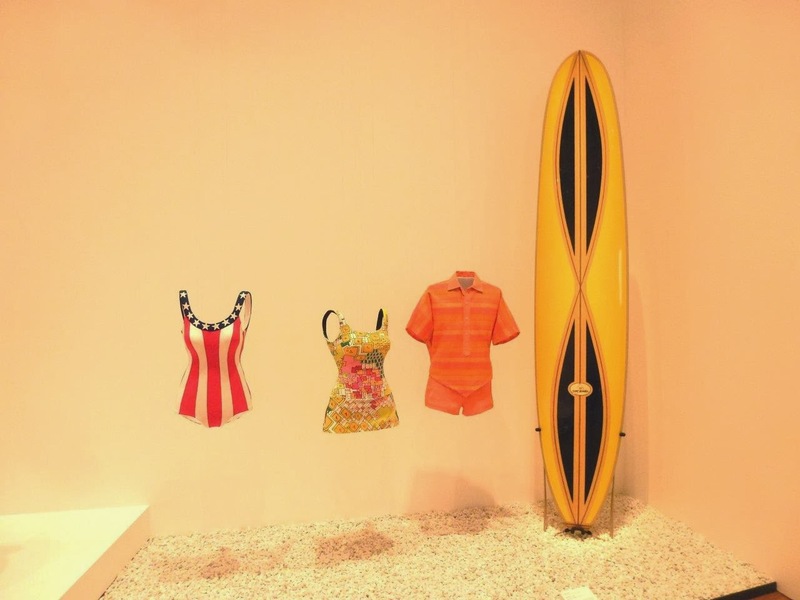 The exhibition is presented in four thematic sections that explore the 'Shaping,' 'Making,' 'Living,' and 'Selling' of the ideas and objects of California Modern. 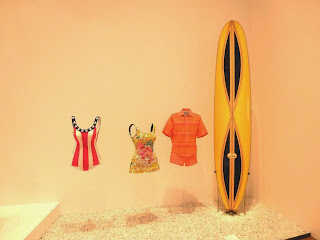 For this surfer boomer, big favourites were the Greg Noll double stringer (the wooden inlay) fibreglass surfboard with signature Noll chopstick fins, the graphic design for the branding of Endless Summer (still one of the all-time great surfing movies), classic Levi 501 jeans, iconic furniture by Charles and Ray Eames, the first Barbie, open light-filled home design, a 1964 Studebaker Avanti and a 1936 Airstream 'Clipper' trailer. 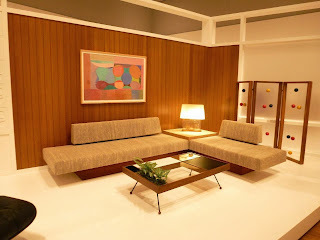 My partner was especially taken by the fashion, including the display of leisurewear featuring several "playsuits" and the house design. While we completed the exhibition (which is ticketed) within a couple of hours, we were looking for more. In the forecourt though our appetites were sated by a demonstration of hairstyling and foundation garments which "shaped" the female form of that era. 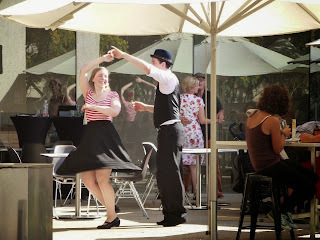 And outside, a troupe of really smart young swing dancers stepped it out all afternoon. Overall, it was a lot of fun and a worthwhile trip down memory lane. 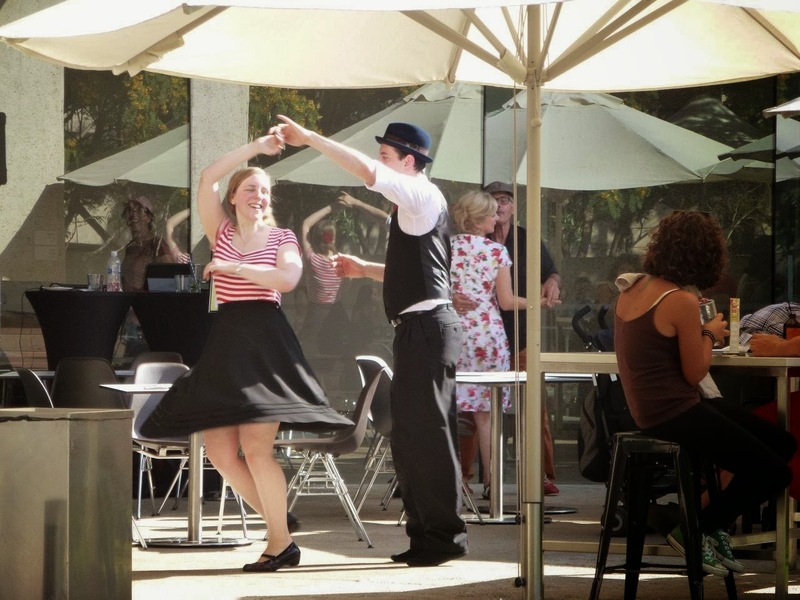 Our arts Brisbane weekend began at check-in at the Mercure Brisbane North Quay directly opposite on the other side of the river. The Mercure is putting on the art style too with its new chic rooms featuring bright green wall tiles and dark grey carpets with big splashes of the vibrant colours lipstick pink, lime green or yellow which are complimented on the bed throws and lounge chairs. Local fine art printmaker award-winner Kelly Fielding has created stunning bed heads, the artworks for which were taken from her linocuts designed to showcase the diverse landscape and lifestyle that she has witnessed everyday as a resident of Brisbane. The hotel offers packages linked to the galleries..
We also visited the very impressive Gallery of Modern Art (GOMA) which is virtually next door to QAG. We spent a lot of time in the Voice and Reason exhibition which draws attention to the reasoning, knowledge and experience behind the work of Indigenous artists, some in dialogue with works by non-Indigenous artists. Artists featured in this display include Vernon Ah Kee, Gordon Bennett, John Citizen, Sue Elliott, Fiona Foley, Robert MacPherson, Luke Roberts and Judy Watson. But don't miss the 25-minute four-channel HD video surround sound installation Everyday Magic. Big news at GOMA is that leading international contemporary artist Cai Guo-Qiang is staging the exhibition Falling Back to Earth, part of which includes an installation of 99 life-like animal sculptures gathered around a watering hole in GOMA's largest gallery, which was inspired by the artist's visit to Stradbroke Island with his family. A meditative second new work will fill GOMA's iconic Long Gallery, inspired by Cai's time among the ancient trees of Lamington National Park and the Daintree rainforest. Cai Guo-Qiang: Falling Back to Earth, is exclusively at GOMA and run to April 21..